“Emergence.” By Joe Menosky. Perf. Patrick Stewart, Jonathan Frakes, LeVar Burton, Michael Dorn, Gates McFadden, and Brent Spiner. Dir. Cliff Bole. Star Trek: The Next Generation. Season 7, episode 23. Syndicated television. 22 May 1994. DVD. Paramount, 2002. It's been nearly a month since Shakespeare and Star Trek week began here at Bardfilm. I imagine that it's about time to wrap things up with some final clips and some final commentary. The Tempest is very good on endings. The number of scholars who have considered it to be Shakespeare's farewell to the stage is very great. I think that that may have been in the minds of Star Trek's writers as they neared the end of their seventh—and last—season. In this episode, Data is trying to put on a production of The Tempest, but he's interrupted: the Enterprise runs amok, goes crazy, and gives birth, which is the reason for Data's confusing remark at the end of the clip (I conflated the beginning and the end of the episode into one file). 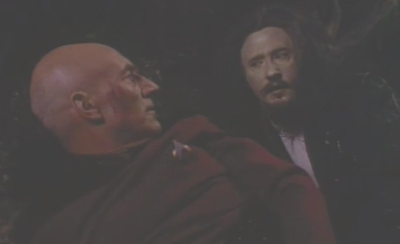 Please excuse the darkness of the clip: as you'll see, it was Data's decision, not mine, to have it so dark.